Ever been in situation where you need to install some apps or copy files from you CD DVD, or perhaps retrieve backups of your works? It must be a frustrating experience when you found out that you can,tinstall or copy them in your PC because the CDs and DVD has been scratched and damaged. So now what to do, How to repair damaged CD DVD and recover data. Yes you can do that with simple and easy steps, there are so many software are available on the net which will help you to Repair damaged CD DVD and Recover Data. Here are some of them for you guys. IsoPuzzle is free program which help you to recover data as much as possible data of damaged CD DVD, bad burned or scratched CDs or DVDs. 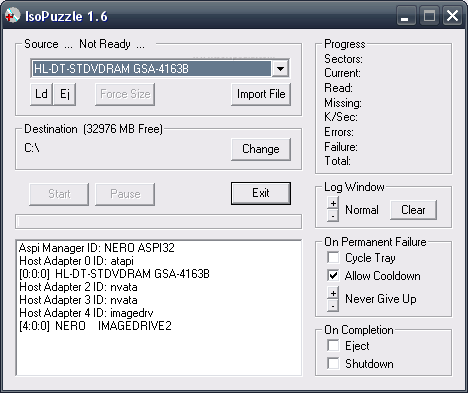 Iso Puzzle creates an iso image of the disc that you place in the drive. All good sectors, that are those that can be read without errors, are written correctly and flagged as good while bad sectors will be flagged as bad. CD Recovery Toolbox is a another free app to Repair Damaged CD DVD & Recover Data. Install the app in your PC and just select the drive that you want to recover from, check the files you want to restore and start the recovery process. The recovery process will take some time, it depends on the size of the data. If your CD and DVD are damaged and you want to recover all the Data From Disc than you have this App CDCheck. If a CD or DVD is showing files with damage or you can no longer read a file in a drive, CDCheck can be switched to recovery mode and make a full sweep of the CD or DVD, recovering lost files along the way. Dead Disk Doctor allows you to copying files from scratched or damaged CD, DVD and helps you to repair damaged CD with simple and easy process. Help your to recover all type of files that you are looking for. 5. Rub a small amount of toothpaste on the scratch CD and polish the CD with a soft cloth. Or squirt a drop of Brasso and wipe it with a clean cloth. Don’t scrub too hard as you may do more harm than good this way. Repeat these steps two to three times to remove the scratches from your CD and DVD. Hope you like these ways to Repair Damaged CD DVD & Recover Data, or if you know any other ways to get data back from a damaged CD/DVD do share with us in our comment section.